How big a Harry Potter fan are you? 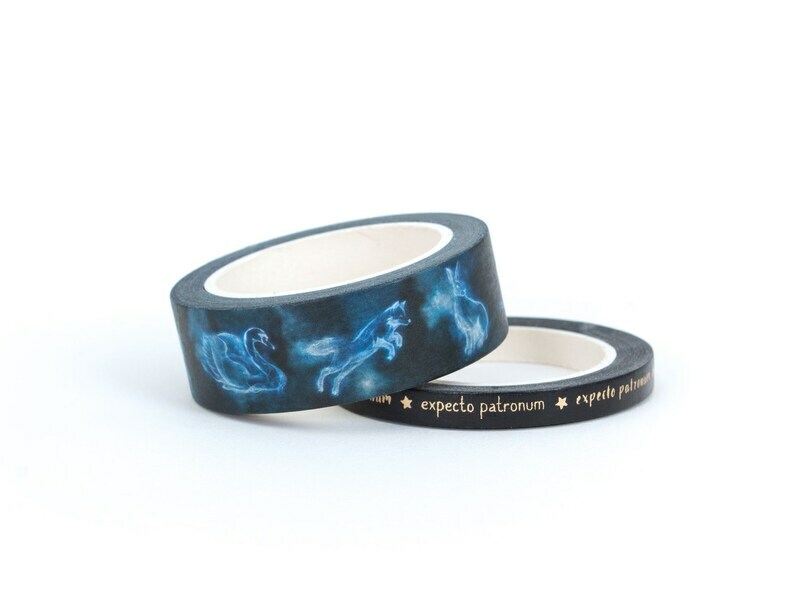 The truly fanatical will know all about the Patronus guardians, and consequently, they'll go crazy for our Patronus washi tape. Planners, travel journals, cards, and so much more are just waiting to be embellished with this extremely cool tape, which features beautiful foil accents. Magical! Add some fun to your planner, travel journal, cards and more with this officially licensed Harry Potter Patronus Washi Tape Set . Finish edges, embellish gifts or just add a splash of color to just about anything with this set of tape featuring beautiful foil accents. Each package contains 1 roll that is 10m x 15mm wide and one roll 10m x 5mm wide. Beautiful washi the color is really vivid not faded at all. It arrived quickly, easy to use, not like some washi that shreads when you try to peel it back or leaves sticky residue on the next layer. Very happy with my purchase. Thank you. I love it! Just as advertised and arrived quickly! Would gladly buy from them again! • We accept all major credit cards, Paypal & Etsy Gift Cards. • If you have a coupon code, it has to be entered during checkout. • If you want us to ship directly to the recipients, please checkout separately with each listing and shipping info of the recipients. Please DO NOT combine orders with multiple addresses in one transaction. All sales are final. For defect items, please let us know so we can have the manufacturer send you a replacement. You can contact the manufacturer for a replacement / warranty, or we can contact them on behalf of you. All the warrant has to go through the manufacturer. • All items sold as it is, we do not accept refund or return. • Shipping costs are not refundable. • Preorder items are specially ordered for you therefor they cannot be cancelled, returned or refunded. • Claims for damaged products must be made within 7 days of receipt. Please keep damaged shipping box in case we need to file a USPS claim. We may ask for picture of damaged item and shipping box to forward to the manufacturer and/or shipping carrier. • Products that have been opened or used may not be returned. • Clearance & Sales items may not be returned. • Return shipping cost is non-refundable & will be bared by the buyer. • Items sold as it is, no refund or return as all custom stamps are made to order according to your specifications. • Please be sure to proof-read everything to avoid any typo. It will be finalized once you approve the design. • We do charge a redo fee on customer mistake. • Accident happens. Dog chews your stamp? Entered the wrong info during checkout? Damaged stamp? Lost packages? Damaged packages? Returned packages? Oversee a typo? NO PROBLEM, let us know and we will be more than happy to make a replacement stamp* for you at discounted price. • If we make a mistake, we will be gladly to correct, redo & send a replacement stamp* to you right away (at our own cost). NOTE * Replacement stamp is as it was initially ordered (an identical stamp with the correct info). And if a layout change is needed, a new order must placed. We ship with USPS First Class & Priority, ready made items usually ship the next 2-5 business days, except for pre-orders. • USA 2-5 business days. • International 1-3 working weeks. • USA 2-3 business days. • International 6-10 business days. • FREE PROOF • A complimentary digital proof is included specially for you. We want to be sure that you are getting what you asked for. It's our way to say "THANK YOU" to our clients & to make sure everything is accurate before it goes into production. • Proof will be sent via Etsy conversation. • For logo stamp, no proof will be sent since you will be providing the logo. • We usually send proof the next business day upon completion of the checkout process. Sometimes it takes up to 3-5 business days due to a high volume of requests & orders. • Please buy with confidence. We will only send proof upon completion of the checkout process. • Without your approval, we WILL NOT proceed. Please be sure to proof-read everything to avoid any typo. It will be finalized once you approved the design. ★ What you see on the proof is what you get on the stamp. * Replacement stamp is as it was initially ordered (an identical stamp with the correct info). And if a layout change is needed, a new order must placed. • We usually will send a duplicate copy to your email just in case you did not check Etsy conversation as often. Please check your e-mail inbox and/or spam folder. The anti-spam filter you have might send the e-mail to junk folder. ▐ IMPORTANT▐ We send proof according to the template / style we have in the listing, reasonable changes like different font are welcome but NO major change or a different style from your initial orders. We don't mind to send proof for up to 2-3 revisions and it will be finalized. If you are looking for something customized, let us know ahead of time so we can send you a quote and set up a custom listing for you. • All of our stamps are made to order, having said that, we do need a few days to complete your orders. They are not off-the-shelf items. We want to ensure your handmade stamp is PERFECT before we send it your way. We produce & ship our stamps on a daily basis. Please allow 3-5 business days for production once you approve your artwork. • Production for custom logo stamp is 2 weeks. • USPS First Class (USA): 3-5 business days. • Regular International Airmail: 1-3 BUSINESS WEEKS depending on location. ★ We will ship to the address registered in your Etsy account. Please make sure the address in your order/receipt is correct before you complete the checkout process. Please note Etsy conversation is not linked to your order so if you send us a message later for address change, we may not be able to catch it right away before shipping your order. • International Registered Air Mail: All registered mails and packages need to be signed for upon delivery. If noone is available to sign for the mails, the postal service will leave a notification with further instructions for pick-up or re-delivery, and it is your responsibility to follow through in obtaining the package. For any reason if you did not pick up the package and if it return to us, you'll have to bare the shipping cost for us to resend it to you. ★ We do not own the shipping company so we have no control regarding delay or Custom hold. Please understand that once your package ships and it's in the hands of the carrier. Thank you for being patience & understanding while your package is in transit. • International buyers are responsible for duties and customs charges that may be incurred. Last minute shopping? We know how it is, now we are offering Expedite Rush Service which puts your order above our "ordering queue" and processed within 1-2 working days, exclude shipping time. • If you wish to ship with Overnight option, check with us. The shipping itself usually cost $25 or more. • Store stamps flat, rubber side down, or standing on edge. Store your clear stamps in a light-free container, away from indoor or sun light. • Clean your polymer stamps with clear stamp cleaners or baby wipes. ★ We recommend dye based ink pad for clear stamp. • The smaller the stamp is, the chances of losing the details is higher. When you purchase a stamp from us it doesn't transfer the copyright of the image to you (under any circumstances we do not transfer any rights to you). The proof you received will have watermark on it. If you wish to have a digital copy without the watermarks for printing purpose, convo us, additional cost will be applied. ★ You'll get 100% clear impressions for Pre-Inked Stamps. • Remove the handle and place 4-6 drops of ink in both openings. Please allow 3 hours for even adsorption. • Using the wrong ink can permanently damage your stamp. Use only oil-based refill ink for Pre-inked Stamp. • Pre-inked Stamp refill colors are available at $7.50 for 0.5 oz. Want to get a surprise discount coupon whenever it's available? *Terms & Conditions are subject to change without notice.